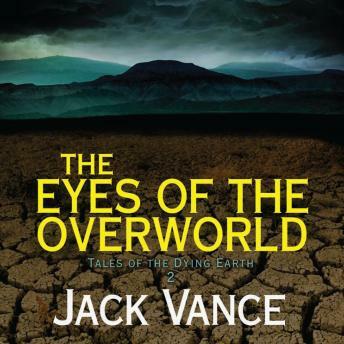 The Eyes of the Overworld is the first of Vance's picaresque novels about the scoundrel Cugel. Here he is sent by a magician he has wronged to a distant unknown country to retrieve magical lenses that reveal the Overworld. Conniving to steal the lenses, he escapes and, goaded by a homesick monster magically attached to his liver, starts to find his way home to Almery. The journey takes him across trackless mountains, wastelands, and seas. Through cunning and dumb luck, the relentless Cugel survives one catastrophe after another, fighting off bandits, ghosts, and ghouls-stealing, lying, and cheating without insight or remorse leaving only wreckage behind. Betrayed and betraying, he joins a cult group on a pilgrimage, crosses the Silver Desert as his comrades die one by one and, escaping the Rat People, obtains a spell that returns him home. There, thanks to incompetence and arrogance he misspeaks the words of a purloined spell and transports himself back to the same dismal place he began his journey. I listened to this book with my family during our drive through the mountains towards Myrtle Beach. We loved this story with its straight forward plots and strong central character. I really dig the way the hero is also kind of a villain too. If you like stories that sweep you away from the mundane, I think you’ll dig this one. This story pukes the dictionary. I believe every other word is 5 syllables. I appreciate my vocabulary being "stretched" but it doesn't help the story. It limps through a dozen little stories loosely tied together in the overriding "been there done that" quest motif. If you want to brush up on your vocabulary skills and maybe prep for a game of scrabble...great enjoy! !